Viewing time: 4 min. 59 sec. The Write Question is a weekly video podcast all about writing. 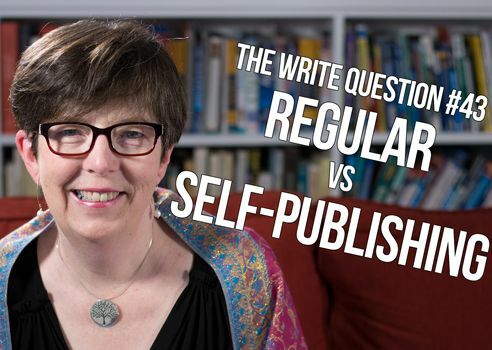 Today’s question focuses on the pros and cons of regular vs self-publishing. [phone recording] Hi Daphne, this is Lisa Rumpel calling from Vancouver B.C. I’m calling about a question I have. I’m wondering whether it’s a better option to self-publish or if it’s better to go to a publishing company and have them critique your work, and look at your work, and really be more recognized possibly. So that is my question to you, just I would love to hear your advice or your opinion about self-publishing versus going to a publishing company. Thanks, Lisa. I’ve addressed similar questions here before but you’ve asked it in a slightly different way so I’m going to take another stab at it. Be sure to look at my earlier videos as well. I’ve included the links below. Let me start with an important proviso. You ask the question as though every author has the luxury of choosing between traditional and self-publishing. I had the visual image of a shopper browsing through the grocery store and trying to decide between laundry detergents. Unfortunately, this is not the way it works with books! It’s extremely difficult to get a contract with a traditional publisher these days and for many writers, that’s just not an option. So, be aware that you may not have a choice. But let’s assume that you’re lucky and you have received an offer from a traditional publisher. Here is my summary of the pros and cons. If you do get a book deal, the publisher will offer you what’s called an “advance.” This means that they will pay you a portion of the royalties you’ll receive when the book starts selling. Royalties are a small percentage of the cover price. Imagine your royalty is $1 per book. If your advance is $5,000, you would have to sell 5,000 books before you made any more money. Another advantage is that you don’t have to put as much money up front; this doesn’t mean it will be “free”, however. You will still have to pay for any photos or illustrations inside the book. If your book needs an index, you’ll either have to create it yourself or pay someone else to do it. And, in order to get the publishing deal in the first place, you may have to hire an editor to help whip your manuscript into shape. The single biggest benefit of having a traditional publisher is that they can get your book into bookstores.This is because bookstores don’t have time to negotiate with a bunch of individual authors, and would rather deal with a small number of salespeople. You may think that a traditional publishing deal will give you lots of prestige and publicity but the economics of book publishing have changed dramatically in the last 20 years. Most authors get very little publicity and many new authors end up feeling unhappy and ignored. The vast majority of authors do NOT earn back their advances and publishing houses always give more attention to the Stephen Kings and the Margaret Atwoods of the world. Also, be aware that the publisher will get to make certain decisions itself. The sales team will decide on the name of your book and what the cover will look like. Your opinion won’t matter. And the whole publishing process can take a long time — up to a year, or perhaps even more. The biggest pro is that you have more control. You can publish the book according to your own timeline and you get to make every important decision yourself. The next biggest pro is that you can make more money per book. Instead of being limited to a royalty, which is usually rather small, you can retain all the profits for yourself. You do need a way to be able to sell those books, however, and this is where many self-published authors fail. This can easily add up to $8,000 or more, depending on how many copies you have printed at once. The next biggest con is that you need to figure out a way to stay in front of your readers. I manage to continue to sell my self-published book because I take the time to write a newsletter every week. If you don’t have that kind of platform, you’re going to find the work of selling a whole lot harder. I know it’s daunting to think about the concept of self-publishing. And I know it feels like a life or death decision. The best thing you can do is to LEARN as much as you can about the industry and do some accounting to figure out what kind of budget you have to spend on self-publishing. If you just don’t have the money, well, the decision may make itself for you! Thanks for your question, Lisa. Some writers can also be business people. If you have the ability to do both of those very different jobs, you may be an excellent candidate for self-publishing. What’s the best option for publishing? What are the steps to self-publishing?